Leading workshops on creating color with natural dyes in my community, alongside running a business offering handmade garments means I spend a lot of time thinking about making. I've found that what really lights me up is not just creating pieces, but the learning process of experimentation, and sharing this process with others. 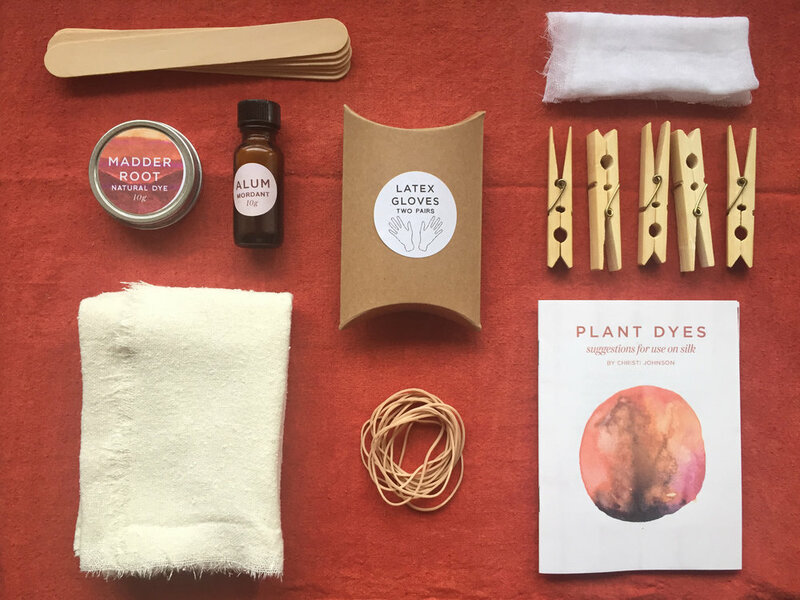 So with a desire to bring the dye studio to more people outside of my community, I introduce MC natural dye kits. Providing fabric, dyes, mordants, even rubber bands and rubber gloves so that all you need is a pot and a spoon to get dyeing! The kits come with a booklet to guide you through the process step by step, and there will be links online to further tutorials I’m creating to walk you through some methods of working. An important part of the production of this kits comes from my mother’s “no landfill” gifting policy established years ago for the holidays. There are no cheap plastic parts, and all the containers and components included are either biodegradable or reusable. I keep reading about this thing I should do called mordanting but... WTF is a mordant? The word “mordant” comes from the french “morde” meaning ‘to bite.’ This best describes the chemical reaction that the mordant allows to take place, it bonds the dye to the fabric more permanently on a molecular level. Pre-soaking the fibers in a mordant provides the perfect opportunity for the dyes to affix to the fibers. I heard that I should "scour" my fabrics before dyeing... um what? Help plz. Scouring is, simply put, giving the fabrics a nice deep clean before dyeing with them. In the manufacturing process (even for organic fabrics) there are many finishing agents used, chemicals that help the fabric be as flat and straight as possible to make it easier to cut. Vintage and pre-loved fabrics should also scoured, because they may have stains or spots that will attract or resist the dye in ways you do not want to happen. Do I HAVE to use a mordant? I don't like the idea or don't want to have to order new materials. That is fine. You'll probably want to use more dyestuff, and allow the fabrics to sit in the dye for longer if you are not using a mordant. Some people are averse to using it and prefer to use a tannin rich natural dye (like black walnuts, myrobalan, pomegranate rinds, oak galls, or birch bark) as a mordant instead. This will add a depth to your final color and also help to bond the dye to the fabric on a molecular level, though not in the same intensity as alum. How long should I leave my fabric in the dyepot? How long do you have? There is no set answer to this question, natural dyes, much like cooking, are all about experimentation and seeing what works for you. If you are using cold water, at least overnight. If you are heating it up you can remove after 1-3 hours, or leave in overnight. You are also more than welcome to see how the color develops when you leave in for a week or more. One of my favorite tie dye techniques to experiment with is jamming the fabric in a tight container, completely submerging in dye, and leaving undisturbed for days. You get really interesting designs, and the dye becomes way more permanent. I want to play right now. What can I dye with that I have in or around my house? I have a few posts in my online journal on this, but red cabbage, onion skins (separate red from yellow for different results), black bean soaking water, black eyed susan flowers, marigolds, and hibiscus tea are all fun places to start that will provide bright colors (on silks especially). I want to try different folding techniques, how do you do them? Fun! I've begun recording videos on some different folding techniques, which can be found on my Youtube channel, link is above under the title "Help Yourself"
If they are all natural, can I use my kitchen supplies with them? It is generally advised to not do this because most natural dyes are not food grade, mordants are used at stronger concentrations than in food preparations, and many fabrics are processed with nasty chemicals. Hi, I’m a witch. How can I use natural dyes in conjuction with my spellwork? Hey girl hey! There are many plants that are used in magic rituals that also create beautiful colors on fabric. I wrote a zine covering quite a few these plants, available in the shop, and will also be sharing some of these in posts in the online journal! Since making a dyebath is much like brewing a tea or herbal bath, feel free to use the same intention setting methods on your fabrics. What books do you recommend to get started? Sign up with your email address to receive updates and sales.